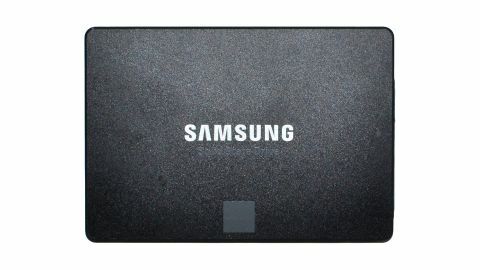 Samsungs 2TB 850 Evo offers the maximum capacity with minimum price per GB, with performance nearly equal to the significantly more expensive 850 Pro. (+) Super Nova: Tons of capacity; great price per GB; good performance, endurance, and warranty; SATA is ubiquitous. (-) Black Hole: 2TB SSDs are still expensive; not as fast as PCIe solutions; SATA is limiting. Solid-state drives are a game changer when it comes to the responsiveness of your PC, but they also tend to be relatively expensive compared to traditional hard drives. The general advice we give to most people is to use a moderate size SSD for the OS and apps, with a larger hard drive for mass data storage. These days you can find 250GB-class drives for under $100, with 500GB-class drives starting as low as $150, and that’s generally enough for most people. But what if you’re not “most people”? What if you think good old Sol is too puny and you want to explore the vast universe, maybe setting up camp around a red super giant? For those who want to put every last document, image, movie, and game onto fast solid-state storage so that they never have to worry about waiting for files to load, never fear. Samsung has your back, with not one but two 2TB SSDs to choose from. Yes, these are still SATA drives, so you’re not going to get the unadulterated speed of a PCIe NVMe SSD, but the largest M.2 SSDs have half the capacity, and outside of a few storage intensive tasks, 6Gb/s SATA is still plenty fast. We have a double-header going on today, with reviews of both 2TB Samsung drives—see the Samsung 850 Pro 2TB review here. Originally listed with an MSRP of $1,000, the 850 Pro 2TB has since come down to more palatable levels—not that $875 is affordable for most of us, but it’s moving in the right direction. The 850 Evo on the other hand has been the darling of the budget-minded computer enthusiast since it first launched, and even more than a year later it’s still difficult to find a better value. The launch MSRP of the 2TB 850 Evo was more than twice the price of the 1TB model, at $800, but we’ve seen prices range from $645 to $670 on Amazon.com during the past week. Let’s put that into perspective. The least expensive SSD we can find right now, in terms of price per GB, is Crucial’s new BX200 (review forthcoming). The 480GB model goes for $132 online while the 960GB model costs $300, giving a final cost of $0.274 to $0.3125 per GB. [Spoiler alert!] The problem is that the BX200 is very much a budget offering, with performance that is at times underwhelming. It’s much faster than a hard drive for random accesses, but it can’t touch the Samsung 850 Evo when it comes to performance. Even with the better performance, however, the 850 Evo 2TB costs just $0.335 per GB—a mere seven percent increase compared with the 960GB BX200. How much of a market is there for 2TB SSDs that cost well over half a grand? That’s a more difficult question to answer—how much of a need is there for interstellar travel? We have to start somewhere, and if you’re the type of enthusiast that likes dream-level hardware like the i7-5960X and GTX Titan X or GTX 980 Ti, you should have no problem considering the merits of 2TB SSDs. Even with 30 modern games installed on the drive, plus the OS and a collection of applications we regularly use, and topped off with some videos and music…we still haven’t even passed the 50 percent full mark. It’s a nice change of pace, not having to think about where to install new games like Fallout 4 or Rainbow Six Siege: everything goes on the monster 2TB drive right now—for testing, naturally. And if you’re thinking 2TB is an insane amount of NAND—or in this case, V-NAND—Samsung is working on 4TB models for release some time in the next year. It’s like a virtual bag of holding for all of your data, and outside of large movie collections or raw video footage, there’s plenty of room. The only potential concern is that if anything ever goes wrong, you could lose a lifetime’s worth of files, so make sure you don’t neglect your backup strategy. If there’s one potential drawback, other than the price, it’s the aging SATA interface. With a single drive, real-world throughput over SATA generally tops out at 550MB/s. That’s way faster than a hard drive, but when you look at the 850 Pro and 850 Evo specs above, you have to wonder how much faster the NAND and controller could run without the SATA bottleneck. This is actually a good thing for the Evo, however, as it means despite the price difference, it can still hang with its big brother. It might be 10 percent slower under heavy workloads, but for many activities there’s no discernable difference. This is basically as good as SATA gets, and since SATA is practically everywhere (except for laptops that eschew 2.5-inch SATA drives in favor of M.2 or mSATA), any desktop or laptop made in the past five or even ten years can upgrade to an SSD. Looking at the raw specs for Samsung’s 2TB SSDs, the only real difference is going to be in peak performance and warranty/endurance. This is largely due to the use of TLC (Triple-Level Cell, three bits per cell) NAND as opposed to MLC (Multi-Level Cell, two bits per cell), which means each NAND cell has to track eight stored voltage states compared to four stored voltage states. Just like the move from SLC (Single-Level Cell, one bit per cell) to MLC was inevitable, we’re seeing more and more manufacturers working on TLC drives. So far, however, no other TLC drive has come close to dethroning the 850 Evo. As we noted in the 850 Pro review, the 500GB/1TB/2TB drives all have the same endurance rating, which is a bit odd since technically with two or four times the NAND, the larger drives should be able to write two or four times as much data before running out of program/erase cycles. The reality is that you would need to be running an enterprise-class workload to burn through all the P/E cycles in five years on the 500GB Evo (about 82GB written per day for five years! ), in which case you should be looking at enterprise-grade SSDs. Raw specs don’t tell the whole story, however, so let’s find out how the drives actually perform in our SSD test suite. We’re using a Skylake test bed, outline below, and we’ve highlighted the two 2TB Samsung drives in the charts. The other drives provide a reference point for some of the fastest and slowest modern SSDs. The 850 Evo 2TB isn’t designed to be a nimble star fighter, but instead it’s a large freighter lugging your data around the known universe. That might not seem particularly exciting, but remember that it’s running on a hyper-drive V-NAND engine that makes HDD airplane engines look archaic. Looking at the charts, a few things should be obvious. First, the fastest SATA drives are all hitting the limits of that interface. Even a merely “okay” PCIe SSD like the Kingston HyperX Predator is able to beat the fastest SATA SSDs in many of our tests. Second and perhaps more importantly, while the 850 Pro is faster than the 850 Evo, at best it’s a 20 percent gap, and at worst it’s a tie. Saving $200 for nearly the same performance is an easy call to make. The only question that remains is whether your PC adventures need copious quantities of NAND. If not, there’s no need to splurge on a 2TB drive—1TB and even 500GB models are readily available. But if you’re a data packrat like me, there’s no such thing as having too much NAND. Recently, I got tired of managing my inventory in Fallout 4 and used a cheat code to boost my maximum carry weight. (100,000 pounds of carry weight? Yes, please, thank you!) A 2TB SSD is like a real-world cheat code that lets you never go back to spinning platters, unless you want to. Granted, you have to pay for this particular “cheat,” but considering the price per GB on SSDs keeps dropping while capacities continue to increase, the days of the hard drive are quickly coming to an end. With higher density V-NAND in the works, not to mention Intel and Micron’s 3D XPoint Technology, that end can’t come soon enough.